I get countless emails from women all around the world who either want me to mentor them or they want me to give them specific marital advice for their relationship. I would love to do both! Everyday. For the rest of my life. Yes, I am that passionate about leading you closer to Jesus and to your guy. But my time is so limited based on all the ministry I do and this is the only way I can help you if you are serious about your marriage. Free access to over 600 articles I’ve written on marriage that you can access at any time on this site. Or if you prefer audio and you’d like to hear a man’s point of view, you can access our free podcast library of close to 100 episodes of our Marriage Mentor Podcast. I’ve also created the following resources to help you cultivate, restore, strengthen, or simply better your marriage or future marriage. My heart’s desire is to equip you with the biblical guidance you need to make your marriage a little less challenging and a little more satisfying. You can learn more about these resources and purchase them through the links below. Grab my book, Wives of the Bible: 25 Easy Lessons You Can Learn from These Imperfect Women that Will Radically Transform Your Marriage. This resource is a simple read. In it, you’ll gain insight and guidance for all things related to a biblical marriage. I regularly read your blog & find it very helpful. I have also just finished reading your book Wives of the Bible. It was brilliant. I read it in three days! Go deeper and grab the Bible study version. Your words of advice have changed me this past year for the better and helped me to be a better wife! 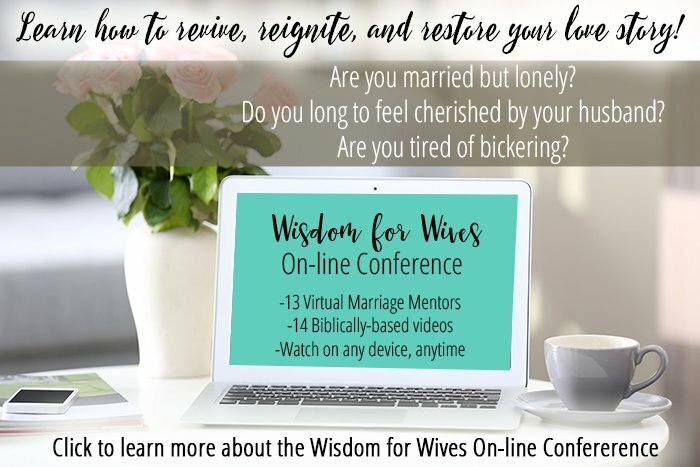 This is an on-line conference consisting of 14 video sessions. Watch at your own pace and when your schedule permits. Click here to learn more. A few days ago I was facing the lowest point in our marriage where I felt like giving up and leaving him behind. I just had second thoughts because of our 3 children. And I know for a fact that Lord will not let me go through this if He will not get me through it. But due to the pain and feeling neglected as a wife, I felt like I wanted to run away from my husband. But God has led me to you and now I am receiving marital guidance which makes me realize what was really lacking in our marriage. I am truly blessed and always excited about the upcoming lessons from you. Thank you so much for sharing your precious lessons with me. An on-line, self-paced course filled with videos, audio recordings, and articles. Although this program is for women, I know men show up here, as well as marriage counselors. Learn more about it here. This morning I began my quiet time praying for a situation in our marriage. Immediately the Holy Spirit spoke into my heart and prompted me to join CWU. I have been receiving your emails for awhile and didn’t think I needed the teachings, as I have been a Christian since a little girl. I don’t have a history of promiscuity, drug, abuse etc. I go to church, read my bible and am very serious about my commitment and walk with God. I could not understand how your teachings would help me with anything I didn’t already know. Yet I knew for sure that the Holy Spirit was directing me to join CWU . I just finished reading the first article that caught my eye and cried all the way through it. It was exactly what I needed. Thank you!!! I am looking forward to your teachings. God bless you as you bless others! Or you can send me an email and if your question is a common marital topic, I might use it in our Marriage Mentor Podcast. If you’ve got a marriage filled with addictions, abuse, and/or adultery, these issues are beyond the scope of the virtual guidance I can give you. You would be wise to go to your church (or the authorities) and have someone in real life walk with you in your time of need.